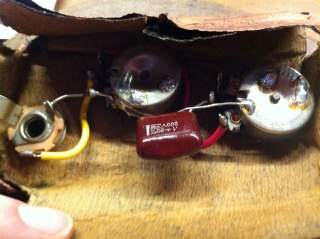 After helping a friend with his 1457 project I realized I had quite a bit on Dano-Silvertone knowledge and most of all, interest. Nice guitars. And a few parts too. 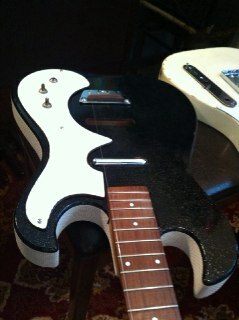 Like this (presumably) late �62 Silvertone 1448 body and neck. Nice neck, and it has definitely been played, which is something I like in an old guitar. 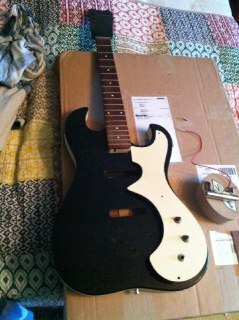 Sadly stripped of most parts and routed for an extra pickup. Nice piece of gear, anyway, and well worth another career. 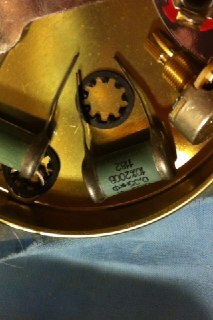 Kluson knockoffs with chrome plastic (!) buttons. Quite all right if you like light weight. Not even close to gotoh or kluson reissue. Price around $20 so perfect for this budget project. Electrics pretty much intact, measure ok anyway. Gonna just solder the new lipstick and do a thingy with the bridge and it should be ok.
Found these in my granddads stash, .050 PIOs from the S.U. This baby don�t need one though, original one still in there. 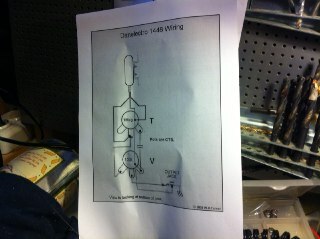 Found this online, my 1448 was close, tone pot was wired the other way round. 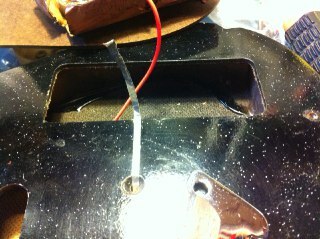 Original 1448 had the pickup in the neck position only. So be it. No bridge grounding on these ones stock. 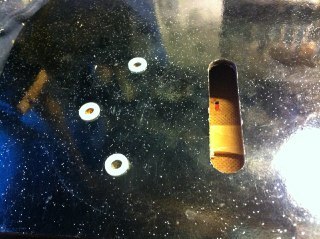 Did it like this, aluminium tape surface mount. Black tape on top to slightly hide it. 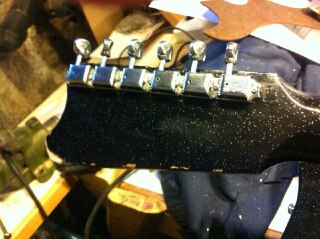 With electrics done, time to attach brand new bridge. 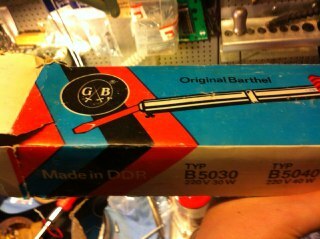 I like to shim these with nylon bushings. 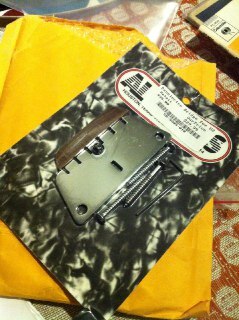 A week later the correct part arrived. 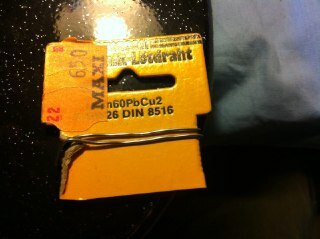 The previous one had the right part number on the package, i guess mistakes happen. 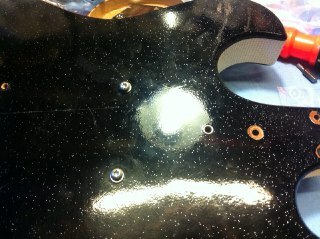 First thought was to fill the extra pickup hole with a precision cut piece of masonite, paint and sprinkle metal flakes on it. Then I thought that it could be cool to just cover the rout with a cool sticker. The hole is a part of its history anyway, and who knows, i might want to try another pickup one day. 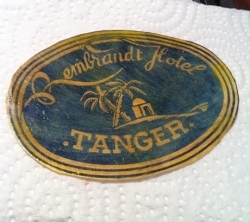 Made a repro of a hotel luggage sticker. Print, lacquer and light relic. Sticker film on. The hotel was operating in �62 and I visited there a couple years back. Nice 50�s vibe there. And its back to life! Great save. Looks perfect. I like the decal. Thanks! Its built pretty much like old luggage so thought the luggage label would suit it. The micro tilt works quite well, I'm shocked. Overall the sound and feel is very good. Intonation too is all right to say at the least. 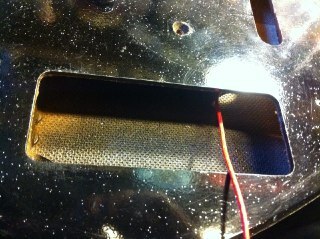 Amp-in-case will be a bigger project, its been under water. Flooding i guess. Its gonna have to wait until the summer, too many more urgent things going on now. 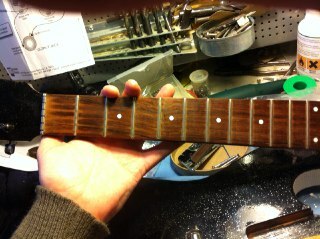 And one more thing, had 09's on when i tried if the neck holds at all and intonation was quite rough. 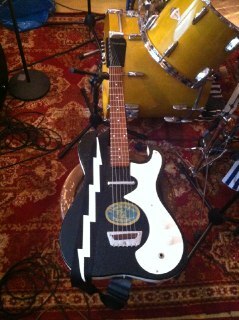 Think 22,5" musicmaster with strings too high - kinda rough. 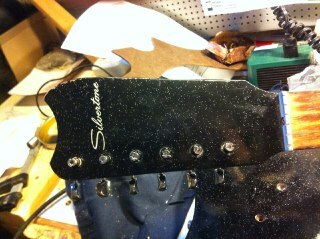 With .11s the neck started working. Guess they were designed for thicker stuff. Now string length is set (with the slightly moving bridge rosewood thing) perfect for low string height, and by loosening the strings and neck screws slightly and lowering the heel with the micro tilt it's ready for slide guitar in a few minutes. Cool feature. Recorded a bit with it.